Taken merely 5 days after it arrived in orbit (28 June 2015), Sentinel-2A took this false-colour image of Sudan’s capital and second largest city, Khartoum. Khartoum sits between the Blue Nile River (which can be seen on the upper right corner) and the White Nile River. Dense vegetation is shown as scattered red dots bordering the river. Agricultural plots along the Blue Nile are rectangular and geometrically arranged, recalling French-style farms. The geometry of the plots allows irrigation to occur. Sentinel-2 was initially designed for monitoring vegetation; however it has recently proved to be much more useful than planned. The mission tracks variability in land surface conditions, with its wide swath width and frequent revisits showing how vegetation changes during the growing season. 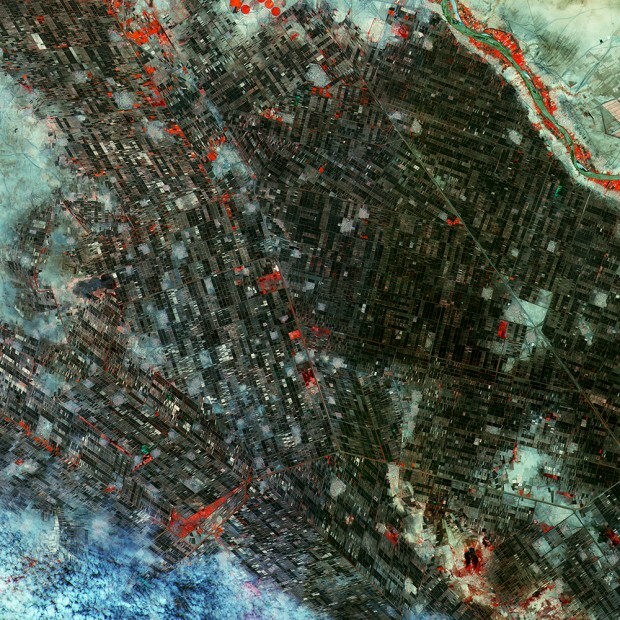 The high-resolution multispectral instrument reveals the area’s agricultural condition. Sentinel-2A has been in orbit since 23 June. It is a high-resolution satellite for land monitoring, providing imagery of vegetation, soil and water cover, inland waterways and coastal areas. Make sure to follow us on Twitter, Facebook and Instagram! The Blue Nile, on the upper right corner of the photo. Great stuff. Thank you. Keep up the good work.